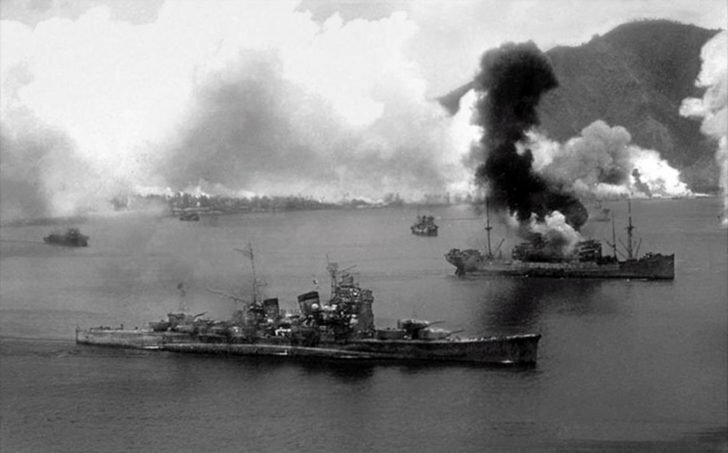 The Japanese heavy cruiser “Haguro” of Myōkō-class is gaining momentum in the waters of Simpson Harbor during a raid by the 5th Air Army of the United States Air Force to the base located in Rabaul (New Britain). In the background, the burning sea transport “Hokusan-Maru” with displacement of 10 thousand tons is seen. The picture was taken by an American reconnaissance aircraft from the 8th Squadron. On this day, the Americans inflicted the first massive air raid, which marked the beginning of the sunset of a powerful Japanese base in the Pacific Ocean. Americans called this day “Black (bloody) Tuesday”. The official communique of the headquarters of the 5th Air Army reported the loss of eight B-25s, nine P-38s, and, in total, forty-five crew members killed, wounded and missing.